Stephen Kay presents a comprehensive Video Operation Guide to the M3 in multiple sections. The entire VOG will be approximately one hour and 45 minutes in length, and is being released in sections as the editing is completed. It will also be available as a DVD for those who wish the convenience of navigation and a larger, clearer video picture. © 2007 by Stephen Kay, Karma Lab LLC. All rights reserved. 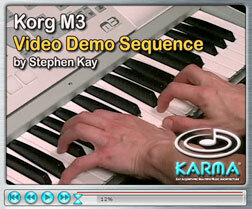 Korg M3 - Video Demo Sequence "KARMA-fied!" 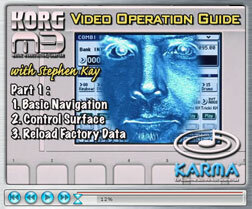 A video companion to the M3 Factory Demo Sequence "KARMA-fied!" created by Stephen Kay. Utilizing real-time performances with 8 different Combis, each section was then augmented and further developed using the internal and external sequencers. Note: this video is a re-enactment of many of the steps involved in creating the demo, along with shots of KARMA and the M3 in action. It is not intended to represent a live performance. The musical portions are available as mp3 files below. All songs © 2007 by Stephen Kay, Karma Lab LLC. All rights reserved. 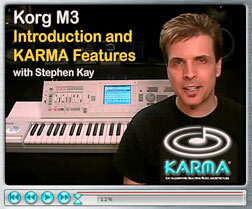 Stephen Kay presents a brief introduction to the new Korg M3, discussing the second generation KARMA Technology it inherits from the OASYS. Includes real-time performances of three of the new Combis from the Factory Voicing. © 2007 by Jordan Rudess. All rights reserved. © 2006 by Frank McComb, Boobeescott Music-BMI. © 2007 by Korg Inc. All rights reserved. M3 Online Virtual GUI - try out the complete interface of the M3 online!